Over the years when I've attended conferences and family history fairs, I've been interested to hear how many people associate Auckland Libraries with just having material relating to Auckland, and nowhere else. We have a range of material in all of our collections that covers other parts of New Zealand, as well as overseas, and by not considering what is on offer, you may miss out on some treasure we have that other libraries do not. 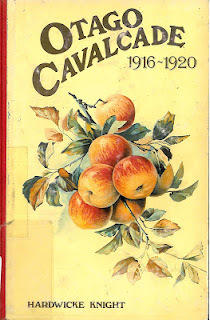 For instance, with regard to Otago we have a series of books that were published in the 1980s covering events in Otago 1901-35 titled Otago Cavalcade. The series is divided into approximately five-year sections and are filled with photographs from the Otago Witness and Otago Daily Times newspapers. While the reproduction of photographs is not always wonderful, they are still worth looking at as they include buildings no longer in existence among other things. The war years naturally cover events occurring at home and overseas. Other events included that are not Otago-specific, are the funeral of King George V, the Boer War, Napier earthquake, and the return of Scott’s Terra Nova to New Zealand. However, the majority of images are relevant to Otago, such as schools, churches, celebrations, buildings and homes of note, floods in the region, delegates at conferences, to day-to-day life. Apart from photographs, there's a short piece on events throughout the year followed by a list of principal events. Each year is covered individually and photographs are separated into annual divisions accordingly. A great find for those interested in Otago. 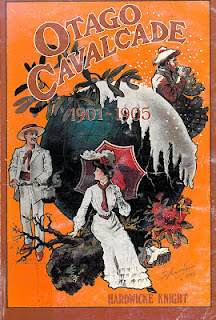 Check out the catalogue for a complete list of our holdings of the Otago Cavalcade - the good news is there are borrowable copies so you can take home an issue, and have a good read.